Cleanse your pet with FFD Pet Wipes. 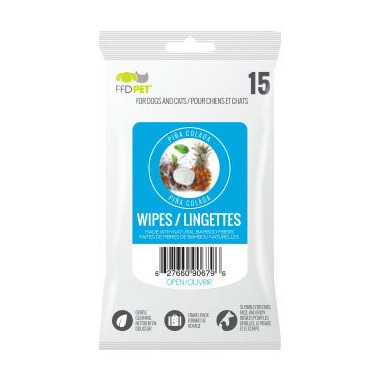 Perfect for the pet parent on the go, these per-moistened wipes are made with natural bamboo fibers and whipe away daily dirt and odor. FFD Pet Wipes are available in 3 great scents and also avaliable in Gentle Unscented for the sensitive little ones. Safe for all over body use ( Ears, face, body, paws) and a great way to freshen up your pup! I use these on my Boston Terrier in between baths. He has very sensitive skin and these do not bother him. Also the smell is nice! I bought this for me, it's not just good for pets! :) Pina Colada smells great.